It is likely that you are at crossroads after acquiring your ideal router. But you don’t have to worry anymore when you can easily buy a router bit to facilitate your task. Generally, it gets more confusing if you are using the router for the first time and that is understandable for a newcomer in the field of woodworking. Choosing the right router bit should not be a daunting task, but you need to know how to go about lest you settle for a completely different tool. 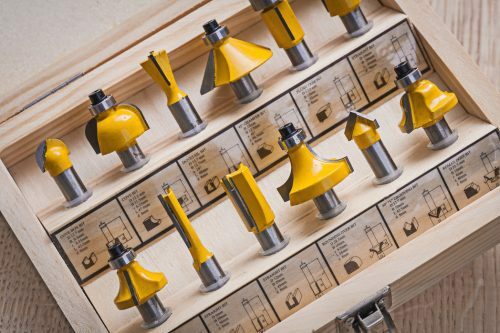 Before you make any step to find the perfect router bits for your router, here is a complete guide that you can always refer to while selecting the right router bit. Which type of router bit are you looking for? A Chamfer router bit will enable you to make 45-degrees angular grooves or cuts at the edges of a wooden surface. The router bit will also help you to create decorations at the edges as well as creating beveled grooves that will match with the multi-sided constructions on a wooden object. The main advantage for choosing Chamfer router bits is their flexibility when creating different Chamfer-sized cuts on the wooden surface. If your target is to create rounded sharp cuts on a square edge, Roundover bit is the best choice for you. Furthermore, you can use this bit to create 90 degrees arcs. The Beading Bit is almost similar to the roundover bit in the sense that you can use both bits to create rounded-shaped grooves at the edge of the wooden surface. The difference comes in where the Beading bit cuts square-shaped shoulders at the top and bottom of the rounded edges of the wood. On the structural aspect, the Beading bit is designed with a bearing tip, unlike the Roundover router bit. A cove bit will assist you when making concave shapes on the wooden surface. Essentially, the Cove bit is designed primarily to create shapes matching with a beading and the stock’s round shape. The Straight-cutting bit is suitable for making a dado (a square channel) at the center of the wooden stock. 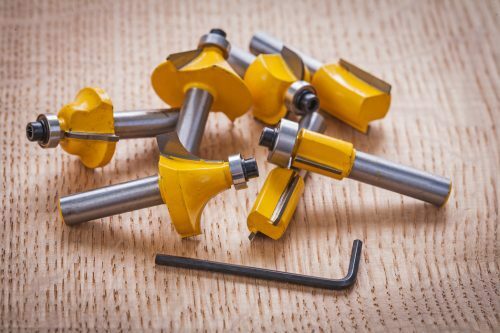 Apparently, these types of bits come in various lengths, sizes as well as diameters to help you craft different shapes and sizes by cutting through or hollowing out at a specific spot on wood. The Rabbeting bit is designed purposely for cutting out a shoulder at the edge of a wooden material to make a joint with pieces of stock. It comes fully equipped with a variety of bearing tips of different diameters to facilitate the creation of different sizes of rabbits. The size of the bit shank is a critical factor when purchasing a router bit. Normally, the router bit shanks come in two different sizes, which are ¼- inch and 1/2 -inch. Both sizes are recommended for most of the ordinary routers, but for the larger profiles, a ¼ inch router bit shank is the best choice. However, the 1/2 inch router bit shank is preferred for the fact that it provides a great stability with a smooth cut all through. The rotary speed of both the router and the router bit are the two most important factors to consider before buying a router bit. The normal router speed is always 8, 000-24,000 rounds per minute (rpm) but the router bit is designed to work at any rotary speed. As a matter of fact, you need to choose a router bit that matches with the speed of the router for accuracy and smooth finish of the work. You should never forget considering the cost for each type of the router you want to buy. The cost is important because it gives you a sense of ownership and that is why you should put it into consideration. The price of the router bit will dictate quality, and as usual, the price is proportionally related to the quality of each router bit. On the hand, some brands come with an unconditional guarantee as a way to give you confidence when buying them. By now, you are fully aware of the types of router bits that match with your router, their sizes, and the cost. Make up your mind as soon as possible and visit stores in your area to sample out the best router bits to enable you to make your woodwork dream come true.